During his speech at the Eurocadres Congress on 30 October 2017, Ludger Ramme, President of CEC European Managers, has highlighted the long tradition of constructive cooperation between CEC and Eurocadres. 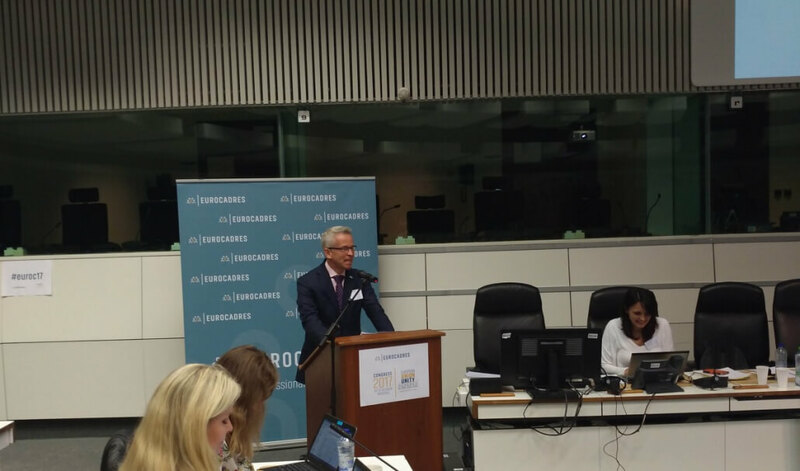 The 50 million managers and professionals in Europe need a strong voice, expressed by Eurocadres and CEC, in the European social dialogue to steer towards more gender equality, sustainable development and intergenerational solidarity, among others. To give more visibility to European managers and to reaffirm their responsibilities, a resolution had been adopted by the European Parliament in 1993 about the European managerial workforce, describing the characteristics of managers and listing their main suggestions for professional mobility, the recognition of qualifications and access on equal footing to representation at all social dialogue levels. Since then, new sensibilities have emerged, new expectations arisen and new economic and global equilibria have settled, significantly changing the background of the resolution. For this reason, Ludger Ramme expressed his intention to work together with Eurocadres on the definition of a new document describing the role, features and centrality of managers in the European economy and society. Please find the speech of Ludger Ramme at the Eurocadres Congress 2017 below.